Urban kitchen design is the combination of clean-cut lines and crisp, uncluttered expanses to create striking silhouettes, a perfect backdrop to a cool modern space. Add a touch of personality and texture by combining streamlined cabinetry and furniture with pops of colour, interesting shapes and unique accessories for a distinguished urban look. We have designed a New York loft feel with this project above. The elegant, snow white cabinets with traditional moulding detail on the doors and contrasting black handles make for a stunningly effective statement kitchen. The bookshelves above not only add additional storage but also provide the ideal opportunity of including pops of colour and character into this monochrome design. From traditional cabinetry that embraces urban touches to high gloss and ultra-contemporary! 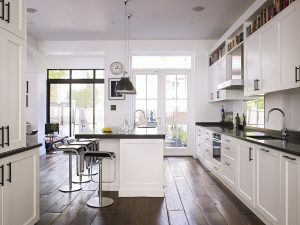 This eye-catching kitchen, with highly minimal and fresh appeal epitomises an ultimate urban style. 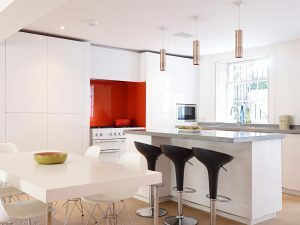 Adding bold colour accents both visible and cleverly concealed in to each cabinets interior, creates vibrancy and impact for a stylishly modern design. Urban style spaces also tend to champion the latest and most innovative of technology. The project below truly illustrates this with its unique and extensive use of colourful LED lighting. 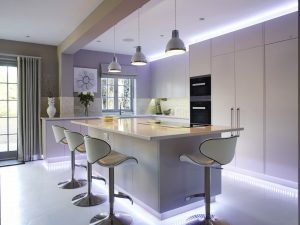 Allowing customers to quickly transform this brilliant white space into an urban party kitchen at the touch of a button, mood lighting at its finest.